Urocyon cinereoargenteus, the gray fox, commonly inhabits the wooded and brushy regions of northern Colombia, Venezuela, Central America, and the southwestern, western (except Rocky Mountains region and Washington state) and eastern United States. This primitive canid is noteworthy for its omnivory (consuming small mammals, invertebrates, and fruits), and a talent for climbing trees. The introduction of the red fox (Vulpes vulpes) into North America from Europe in the 1600's and increased agricultural development are implicated in the decline of Urocyon populations in Canada. Urocyon is one of the earliest foxes to appear in the fossil record. The extinct species U. progressus is recorded from Blancan (approximately 3.5 million years before present) localities and may be ancestral to U. cineroargenteus, which appeared about 1.5 million years ago. By the end of the Pleistocene, U. cineroargenteus was widely distributed across North America. Molecular phylogenetic analyses identify Urocyon as the basal canid, not closely related to any of the other canid groups (the wolf-like canids, South American foxes, or the Vulpes-like foxes). However, morphological studies suggest that Urocyon and Otocyon (bat-eared fox) are sister taxa, most closely related to Vulpes. Distinctive lyrate to U-shaped parasagittal crests on the skull, and a dentary with a well-developed subangular lobe and high condyle, are features shared with Otocyon. This specimen, a male of the subspecies scottii, was collected 14 miles east of Fort Lowell, Arizona. It was made available to The University of Texas High-Resolution X-ray CT Facility for scanning courtesy of Drs. Blaire Van Valkenburgh and Jessica Theodor, Department of Organismic Biology, Ecology, and Evolution, University of California, Los Angeles. Funding for scanning was provided by Dr. Van Valkenburgh and by a National Science Foundation Digital Libraries Initiative grant to Dr. Timothy Rowe of The University of Texas at Austin. This gray fox is one of several canid carnivorans included in ongoing research of respiratory turbinates by Drs. Van Valkenburgh and Theodor. The specimen was scanned by Matthew Colbert on 19 October 2000 along the coronal axis for a total of 477 slices, each slice 0.241 mm thick with an interslice spacing of 0.241 mm. The dataset displayed was reduced for optimal Web delivery from the original, much higher resolution CT data. Note: there is minor radial distortion of the image dimensions in the applet and slice movies. This causes the outside of the image to appear approximately 2% too small, and the center of the image 2% too large. Anderson, E. 1984. Review of the small carnivores of North America during the last 3.5 million years. Special Publication of the Carnegie Museum of Natural History 8:257-266. De La Rosa, C. L., and C. C. Nocke. 2000. A guide to the carnivores of Central America. The University of Texas Press, Austin. 244 pp. Fritzell, E. K., and K. J. Haroldson. 1982. Urocyon cinereoargenteus. Mammalian Species 189:1-8. Geffen, E., A. Mercure, D. J. Girman, D. W. MacDonald, and R. K. Wayne. 1992. Phylogenetic relationships of the fox-like canids: mitochondrial DNA restriction fragment, site and cytochrome beta sequence analyses. Journal of Zoology (London) 228:27-39. Ginsberg, J. R., and D. W. Macdonald. 1990. Foxes, wolves, jackals, and dogs: an action plan for the conservation of canids. IUCN, Gland, Switzerland, 116 pp. Huxley, T. H. 1880. 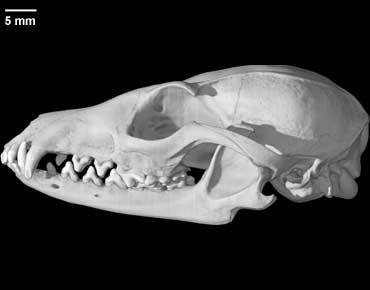 On the cranial and dental characters of the Canidae. Proceedings of the Zoological Society of London 16:238-288. Jaslow, C. R. 1987. Morphology and digestive efficiency of red foxes Vulpes vulpes and gray foxes Urocyon cinereoargenteus in relation to diet. Canadian Journal of Zoology 65:72-79. Kurtén, B. and E. Anderson. 1980. Pleistocene mammals of North America. Columbia University Press, New York. 442 pp. Tedford, R. H., B. E. Taylor, and X. Wang. 1995. Phylogeny of the Caninae (Carnivora: Canidae): the living taxa. American Museum Novitates 3146:1-37. Tedford, R. H., X. Wang, and B. E. Taylor. 2001. History of the Caninae (Canidae). Journal of Vertebrate Paleontology 21 (Suppl. 3):107A. Trapp, G. R, and D. L. Hallberg. 1975. Ecology of the grey fox. Pp. 164-178 in: The wild canids: Their Systematics, Behavioural Ecology and Evolution. Fox, M. W., ed. Van Nostrand Reinhold Co., New York. 508 pp. Van Valkenburgh, B., J. Theodor, A. Friscia, and T. Rowe. 2001. Respiratory turbinates of carnivorans revealed by CT scans: a quantitative comparison. Journal of Vertebrate Paleontology 21 (Suppl. 3):110A. Wayne, R. K., E. Geffen, D. J. Girman, K. P. Koepfli, L. M. Lau, and C. R. Marshall. 1997. Molecular systematics of the Canidae. Systematic Biology 46:622-653. To cite this page: Dr. Pamela Owen, 2002, "Urocyon cinereoargenteus" (On-line), Digital Morphology. Accessed April 24, 2019 at http://digimorph.org/specimens/Urocyon_cinereoargenteus/male/.